This storage box, suitable for storing large sized geographical maps is manufactured from a single piece of board material and has a closing flap at the narrow side and have attached sticking latches in the interioer of the box. Adhesion is carried out with hot glue (technical gelatine). Several boxes can be stacked one above the other. The main advantage of either three-edge or square-shaped storage boxes is that they can be stored easily and are cheaper in production. On the other hand, one disadvantage of such a storage type of box, is that the map being stored has to be slid in alongside its complete length and in the process could get damaged. 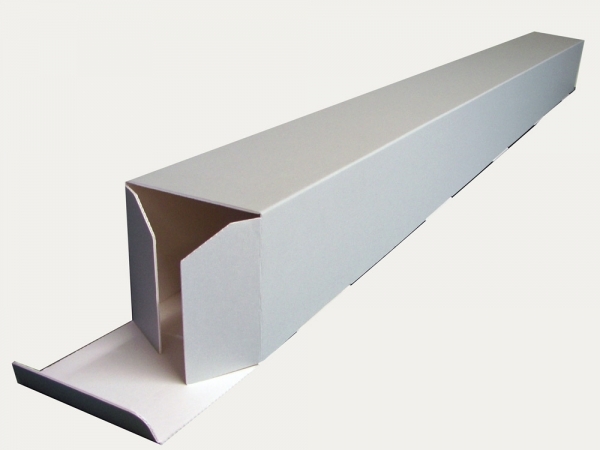 A further development of the gummed (glued-design) box for roll storage is that it can be delivered flat, as a single piece, and can upon requirement be simply put together. 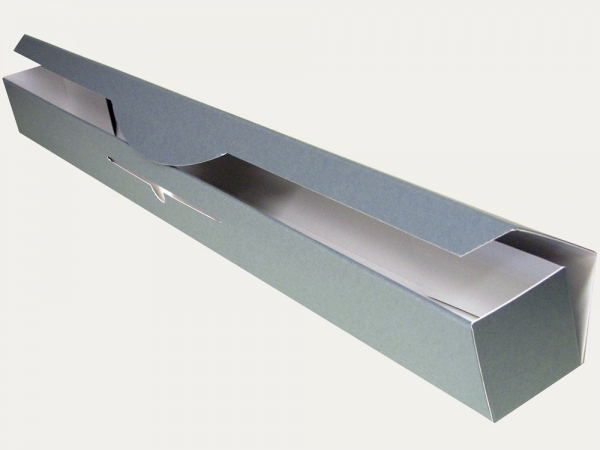 This box design though does not have smooth interior surfaces – which could perhaps cause damage to the stored object while being slid in alongside the complete length of the box. The third picture shows another special construction of our archival box KS 13. 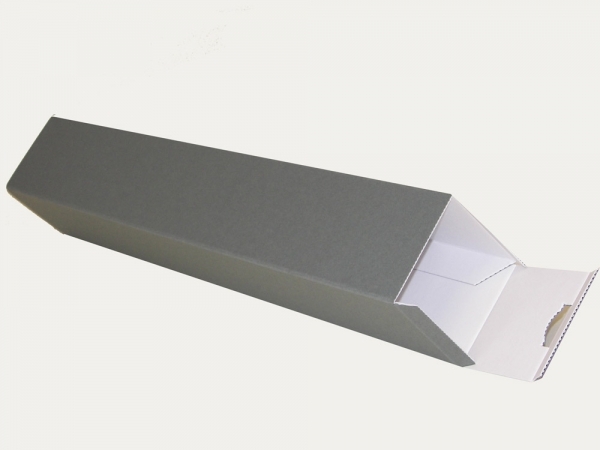 This box type is characterised by a simple folding construction. 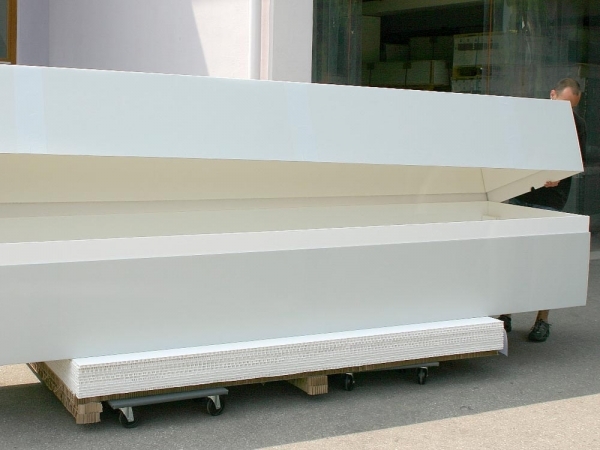 The box has smooth interior surfaces and can be delivered flat. However, the major advantage of this construction is that the object to be stored can easily be slid into the casing without any damage being casused. The two-piece box for rolled objects (pictures 5-6) is also very frequently in use. The KS 16 box with a square crosscut can be produced either with a covering lid in full height/length or with a lid of reduced size. The objects to be stored are inserted into the box from the top. Traditionally one uses tubes (picture 4) for storing rolled objects. The spirally wound tubes can be delivered with plastic lids on either side. The object to be stored is slid into the interior of the tube. 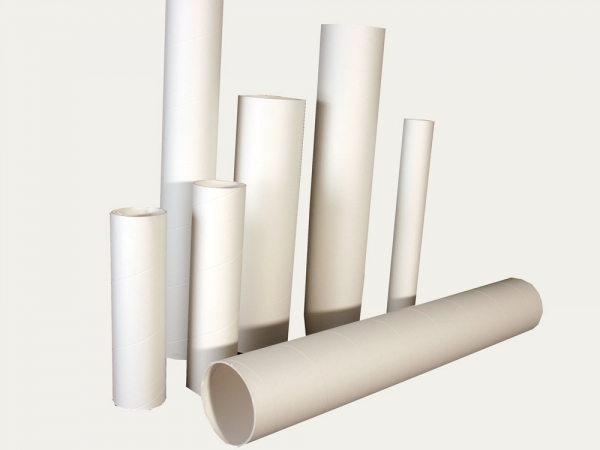 These tubes, in comparison to tubes with three to four corners, have smooth interior surfaces which enables one to easily slide the object into the tube without casung damage. However a disadvantage of this type of storage method is that the tubes can be stacked only onto shelves with lateral side margins (limitations). 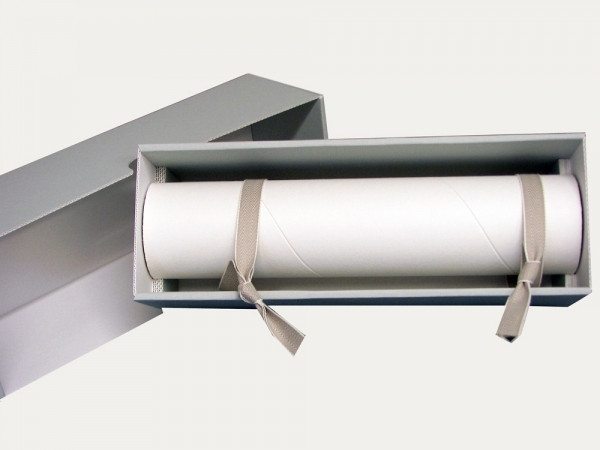 The KS 16 box with a tube insert is ideal for storing delicate and fragile objects. The tube insert is made from spirally-wound conservation board 017. The tube ends are supported by two pieces of corrugated board. This allows easy placement as well as removability of the stored objects. The stored object is not exposed to any kind of pressure, so that even delicate painting layers are spared. The tube is delivered with two textile ribbons to enable easy manoeuvrability. The boxes can be easily stacked and are are ideal for large-sized objects.